I’m fluttered…no wait…flattered, that’s the word. Lou (aka Bogsider) has very kindly given me the Butterfly award. I discovered this when I was sitting in the car on our hide-from-the-heat trip down the coast from Merry Beach on the verge of tears because of the pain from my back and grabbing a quick dose of net therapy on my mobile while I actually had a signal. Made my day it did. Thank you Lou! *Yes, I’m a pedant, I can’t help it. Thank you so much! and I’m a pedant too, I noticed the grammar as well…. What a pretty award! Thank you Mimsey! I’m also flattered! I’m so new at blogging that it’s taken me awhile to understand the award system, but what I’ve learned is that the presence of those little badges on our puffed-out bloggy chests are glorious reminders of why we send our humble words out into cyberspace in the first place: to reach people. When we’re lucky, they reach back and friendships are formed. 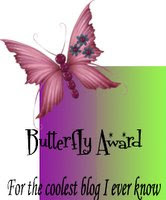 I value your friendship Mim and thank you again for considering me worthy to stitch the Butterfly Award onto my blog. Oh, that’s great. What a beautiful and fun award. I’m in shock actually. I have been missing the past few days, NOT because the hot dogs took me out (wink, wink), but because we have been battling the flu at my house. I can’t wait to add the award to my blog and tag 10 others as well!